All cell types of multicellular organisms arise from a single, totipotent precursor. While possessing markedly distinct functions and behaviors, each cell type contains the same genetic makeup. The immense diversity of cell types is generated and controlled by a complex interplay between spatial organization of genetic material within the nucleus, epigenetic modulation of transcription and the action of lineage specific factors. 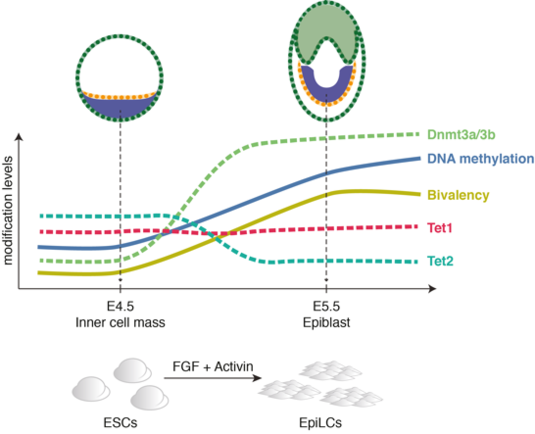 Epigenetic plasticity in vivo reaches a peak in the E3.5 pre-implantation blastocyst, from which embryonic stem cells (ESCs) are derived (Hackett and Surani, 2014). Naive pluripotent ESCs are characterized by a particularly permissive chromatin state, in which DNA methylation and Polycomb mark levels reach their nadir (Leitch et al., 2013; Marks et al., 2012). After implantation (E3.5 - 6.5), the epigenome undergoes a dramatic reprogramming defined by a global wave of DNA methylation, an enrichment of H3K27me3 at developmental genes, and the restructuring of the 3D chromatin architecture (Perino and Veenstra, 2016). The main interest of our group is to uncover the epigenetic mechanisms that define and govern the transcriptional programs required for the controlled exit of pluripotency. In particular, we are investigating the catalytic and noncatalytic functions of DNA modifying enzymes and their integration into the epigenetic and transcriptional circuits controlling the transition from naive to primed pluripotency. Towards this goal, we are using an integrative approach that combines in vitro models with biochemical, genomic and genome editing approaches.